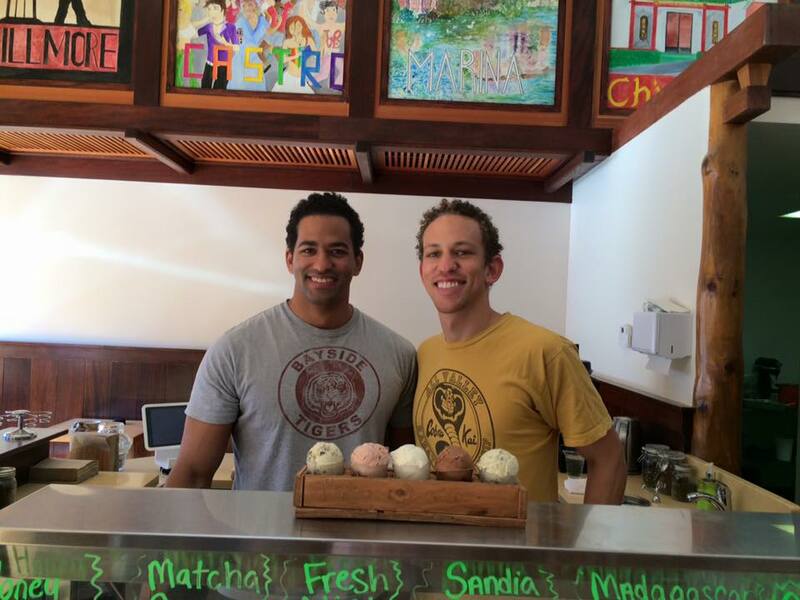 SFHC was the first creamery in San Francisco to make small batch ice cream completely from scratch on-site. We are the closest "From farm to cone" as it gets. WE TAKE NO SHORT-CUTS. As licensed pasteurizers, we are unshackled from working with a pre-made ice cream base and have absolute control over richness, texture, consistency and flavor. WE PRIDE OURSELVES ON BEING INVOLVED ALONG EVERY STEP OF THE WAY AS WE TAKE INDIVIDUAL AND PRINCIPALLY LOCAL, RAW INGREDIENTS AND TURN THEM INTO DELICIOUS AND UNIQUE ICE CREAMS. WE hand CRACK AND SEPARATE 2,000+ EGGS PER WEEK TO USE IN OUR ICE CREAM AND WE UTILIZE EVERY PART: YOLKS FOR THE ICE CREAM; WHITES FOR OUR HOMEMADE WAFFLE CONES. WE MAKE ALL OF OUR OWN MIX-INS, FROM OUR MARSHMALLOWS and FUDGE SAUCES, to SPECULOOS and BAKLAVA - BECAUSE LET'S FACE IT - WHEN IT'S FRESH, SIMPLE AND HOMEMADE, IT JUST TASTES BETTER! At the corner of 9th Ave and Irving St.
Saadi, a cultural documentarian who after years of traveling around the world and developing culinary skills along the way, wanted to return to California to embark on a new venture and share his artistic & culinary experience with the folks back home. Both wanted to establish a family business that provided its customers an amazing product, family-style customer service and a unique feel-good environment. We consider everyone on our team to be family. As representatives of our business, we have our staff know that friendly, welcoming service is cornerstone to the environment we wish to provide. We continuously work with our team members so that they are knowledgable about not only our ingredients, process, and business practices but about the industry in general. As owners of a business, we find it imperative to pay above minimum wage and require the best and most welcoming customer service the city has to offer. We are committed to providing you the closest "from farm to cone" experience as possible, which is why our ingredients are simple. Milk, Cream, Eggs, Sugar and whatever the natural flavor is (we do NOT use artificial flavoring, artificial coloring, or stabilize with any chemical preservatives). We source from local farms and use produce that is in season to provide the best and freshest flavoring possible. Everything disposable we provide is compostable: spoons, bowls, cups, straws, napkins etc. As business owners we feel an obligation to have a practice that is environmentally conscious, and do everything in our power to minimize our footprint on the earth we treasure. Additionally, as members of the community, we believe it is essential to be involved and do our part whenever possible to support good causes in any way we can. Be it for education, non-profits, volunteer organizations or community development projects, we want to be there with you. Now, after nearly two years in the making, their latest vision has come true! It took extreme dedication, creativity, repeated returns to the drafting board and countless meetings and hearings, but the brothers pushed through and made the first ice cream truck of its kind in the city; a classic VW/ San Francisco icon that houses their unique and acclaimed ice cream. In 2018, San Francisco’s Hometown Creamery established a presence in Union Square, one of the most recognized commercial shopping and entertainment districts in the country. 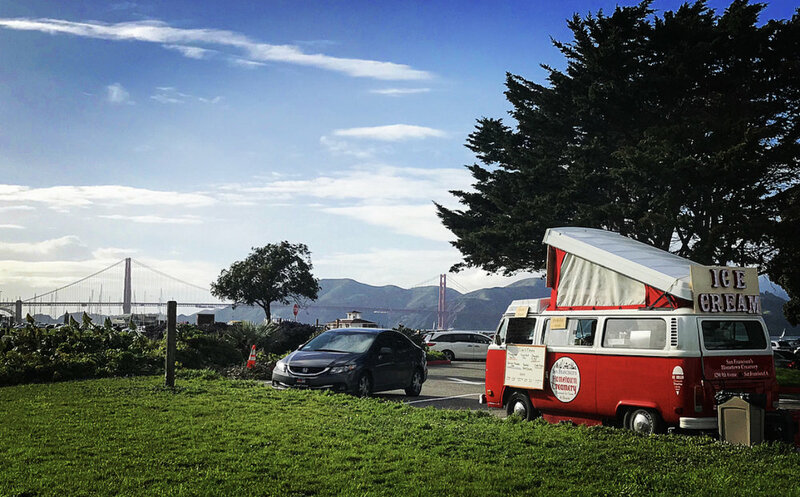 In the spring of 2019, another location was added to the VW route in The Marina between Marina Green and Fort Mason. If you are interested in having us liven up one of your parties with our premium ice cream and our friendly and homey service, be it a wedding, b’nei mitzvah, quinceañera, corporate party, block party, festival, you name it, we’re there! To find out more about our different packages, please email us at info@sfhometowncreamery.com or call us at (415) 682-4977. How is your "from scratch" different from everyone elses? Previously, "from scratch" meant starting with a vanilla ice cream base (milk, cream, eggs, sugar and vanilla) then adding flavor to it and churning it. We take it a step further by starting with the raw ingredients. We make our own base and have complete control over the ratio of cream, milk, eggs and sugar. We can also infuse flavors directly into the base during the pasteurization process and can make more complex bases that truly capture the flavor trying to be attained. No. We are neither a chain nor a franchise. We are a family business and plan to keep it that way. A major aspect of our business model is taking pride in the fact that we are a local, family owned business that is involved in the community in which we live. We prefer to have a face and a story to match the ice cream that we put so much effort into making. We feel so fortunate to be able to have the personal interactions we have everyday with both returning locals and visitors alike. How often do you change your flavors? Currently we have 4 flavors that are called "Hometown Favorites that are always present: Madagascar Vanilla, Chocolate Sorbet, Fresh Mint Chip and Peanut Butter Chocolate Fudge. The other 5 rotate seasonally, about every month or so. We try and keep the rotational flavors long enough so that you can come back and get it a few times if you enjoy it, but change frequently enough so that you can always look forward to something new. We also work seasonally to use fruits, nuts and flavors during their peak season for the richest and freshest flavor. What kind of flavors do you do? Where does the inspiration come from? Saadi, SFHC's Chief Dairy Alchemist, draws inspiration from all over the world. Sometimes he does his take on traditional flavors such as Fresh Mint Chip, Peanut Butter Chocolate Fudge and Cookies n' Cream. Other times he creates flavors inspired by desserts from around the world such as Alfajores (Argentine Dulce de leche cookies), Sufganiyot (traditional Hanukkah Jelly donuts), Halva (middle eastern sesame seed confection), and Turrón (Traditional Spanish christmas dessert). Sometimes they are just flavors that come to his constantly pondering flavor obsessed mind such as the Rhubarb Orange Blossom Gimlet Sorbet, Crème Fraîche w/ Candied Ginger and Kumquat or Roasted Black Sesame with White Miso Caramel.